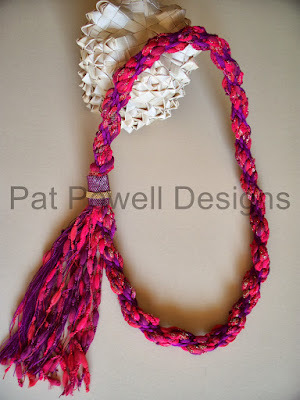 Starting to gather up my work for the Contemporary Handweaver’s of Houston Annual Sale (www.weavehouston.org). Finished this braid last week. I just noticed the photo and the braid are not the same colors. Not sure where the change occured. Both colors (image and actual) are great. The braid is actually red; very red. Once again I used one of Giovanna Imperia’s fabulous yarns. I’ll be posting more items for the sale as I gather them up. I love seeing your work Beautiful! Like the photo even if it isn’t the right color and nice watermark!